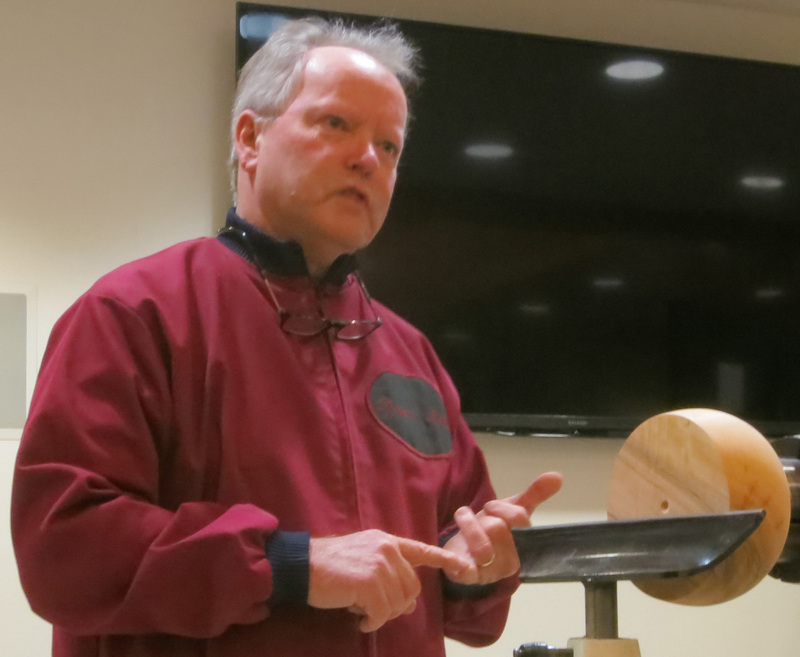 Dennis presented a comprehensive tutorial on hollow form turning. His extensive collection of tools was inspiring. He displayed a large collection of his previous work. He turned a piece while describing the processs. 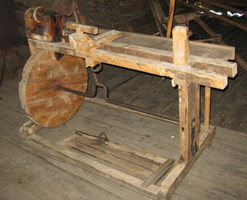 He had seriously important tips on the "do's and don't's" of hollow form turning. This session had value for both novice and advanced turners. His style is strictly 'hands on', no jigs or fixtures to aid the process. Remember to come to the Holiday Party on December 13 ! The club provides turkey, ham, mash potatoes, stuffing, gravy, coffee, water, plates, and silverware. A sign up sheet will be passed around at the November meeting for you to indicate what food you would like to contribute. There is always good food, and a good time. No alcohol, but feel fee to bring other drinks. We will continue our tradition of having an ornament raffle as well as a turning exchange. Members and guests are encouraged to donate ornaments for the raffle, which are auctioned off to help offset the party’s cost. The turning exchange is equally easy. 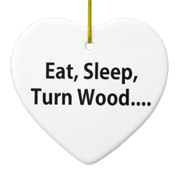 Members bringing turnings (wrapped please) will receive a ticket for each turning. You are welcome to bring a turning for your significant other/guest. The person holding the first ticket called gives their turning to the person holding the second ticket called. This continues to the last person, who will give their turning to the member that started the process. There have been some very nice exchanges over the years ! 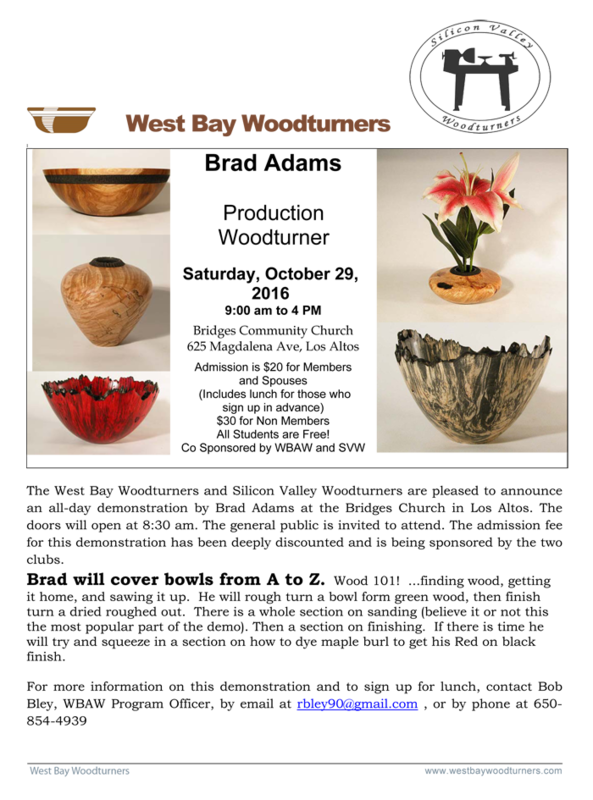 The guest artist demonstrations have been very successful largely because of the cooperation with Silicon Valley Woodturners (SVW) and us. We are looking to other activities that can be beneficially shared between SVW and the Santa Cruz club. Along this line, we are inviting SVW and the Santa Cruz club to participate in our Craft Supply orders. Hopefully, with the addition of these clubs, we can reach the $1,000 threshold for order placement quicker. We have also invited these clubs to participate in next year’s Ice Cream Social. Ideas for additional activities that can be shared are welcomed. For more than three and a half years, Ken McCloud has been handling the purchasing and selling of the CA glue and has done a great job. Thanks Ken for all the effort. Ken has handed off the CA task to helpers and myself. I will be handling the storing and ordering of the glue. Because I’m busy during the meetings, somebody else will be doing the actual selling. Near term this is David. How this arrangement will work is being refined, so have patience. We are now collecting 2017 dues. Please pay your dues on time, this saves time and energy chasing down late paying members. 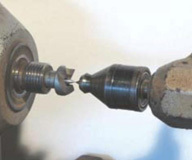 This will bring up the article 'Aligning your Lathe'.